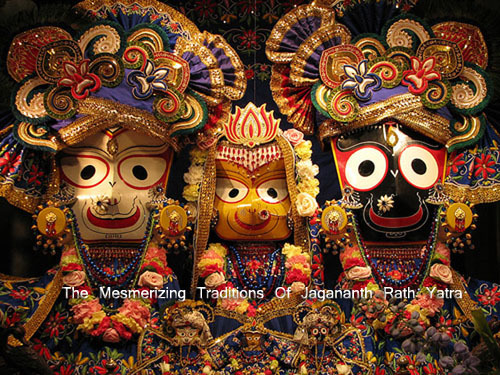 The Jaganath Rath Yatra is one of the most ancient spiritual traditions, which is observed with even greater zeal and fervor in the modern times. Dating back almost 5000 years, this annual celebration, which takes place in Puri in Odisha, thousands of devotees of Lord Jaganath throng the city to take part in the festivities. During the month of Asahad every year, Lord Jaganath, along with his brother, Lord Balabhadra and Sister, Devi Subhadra leave the sanctum sanctorum to travel to their Aunts’ place in Gudicha Temple. The journey is carried out in a specific chariots especially build new every year for each of the three deities. Lord Jagannath’s chariot, called the Nandigosh is 45 feet tall and weighs 65 tons. It has 16 wheels and is identified by the image of the Garuda on its crest and is drawn by with four white wooden horses. The chariot is decorated with red and yellow canopies. Lord Balram’s chariot, Taladhwaja has 14 wheels and features the image of Hanuman on its crest. It is drawn by four black wooden horses and is decorated using red and green canopies. Devi Subhadra’s chariot is called Padmadhwaja and has 12 wheels. The chariot features the image of lotus on its crest and is drawn by four red wooden horses. The chariot is decorated using red and black canopies. What makes the Rath Yatra unique is that each of these massive chariots is pulled for the entire length of the journey only by the devotees. The devotees believe that pulling the chariots will bring them good luck and prosperity.